Rip Hepple, veteran Loch Ness Monster expert, has published the latest issue of his long running Loch Ness newsletter, "Nessletter" (dated February 2015). The main focus of his newsletter this issue is his time at the Loch Ness Investigation Bureau, with a particularly interesting feature on "night drifting". I would point out that an archive of Rip's older newsletters can be found here on Google Drive. Rip's newsletter has been running now for over forty years and has been a valuable source of information and analysis throughout those years. I continue to look forward to his wisdom and analysis. There are a few items on Frank Searle that have built up, so I would like to put them under this one article. As ever, anything about the most infamous of monster hunters always generates more than average interest. Firstly, I got back to Paul Harrison, author of The Encyclopaedia of the Loch Ness Monster, asking about his book on Frank Searle. Some readers may recall a previous article in which it was stated that Paul had tracked down Frank to his home in Fleetwood before he died and conducted a series of interviews. Frank Searle died on the 26th March 2005, having previously spent fifteen years camped at Loch Ness in pursuit of the Monster. Paul now tells me that the book will be published in August or September this year. It should prove to be a stimulating read! As I have said before, I don't regard any person as 100% evil, nor any other as 100% good. Most of the stuff we read demonises Frank Searle, and some of it will be deserved, but as they say, the victors get to write the history. 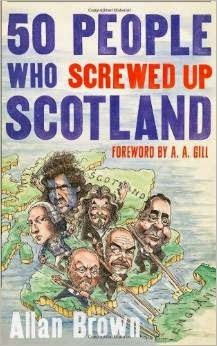 On my second point today, Frank Searle certainly gets that kind of treatment in a book called "50 People Who Screwed Up Scotland" by Allan Brown. This is a recent publication, having come out last May. Amongst these fifty personalities, I found that Frank Searle was entry number 48 after Alex Salmond. If you go to the Amazon entry and click on the book image to "Look Inside", you can find that entry and read what Allan Brown has to say about Frank Searle. I don't think one would learn anything new as a Loch Ness researcher, but you'll get the point about the vilification of Frank Searle. Finally, and I suppose by way of balance, I have placed one of Frank's books on my Google Drive. It is his 1977 booklet, "The Story of Loch Ness" and you can access it as a PDF document at this link. It will prompt you to enter a password which is "nb2vsm6p". I reviewed that book in a previous article, but you can read it for yourselves now. I see no reason to withhold its distribution as I see no copyright claim on it and I am sure it would be Frank's wish to see it receive a wider readership. After all, having by then spent eight years at Loch Ness, you would expect some degree of knowledge from the man. Judge for yourself, but I am leaving the main judgement until Paul's book comes out. I note a piece of Loch Ness history is on sale for the mere price of around £450,000. It is the Foyers Lodge just outside of the village of Foyers on the south side of the loch. Holding twelve bedrooms, it has been a hunting lodge, a hotel and a house to let. But, as I recall, and others may correct me, this was where Tim Dinsdale lodged during the week he captured his famous film footage and I do believe Peter O' Connor was there when he took his controversial photograph down the hill. It was the then proprietor of the lodge, Hugh Rowland, who motored his boat out onto the loch for Tim to film his comparison footage and Hugh claimed his own triangular hump sighting back then. We were constantly being asked about the Loch Ness monster and one afternoon, along with two guests, we did see an upturned cabin cruiser sized object out in the bay which sank and then reappeared then sank for good. The hotel had a very friendly ambiance but quite often we did see a little white dog disappearing under the kitchen table. Also, after pooh poohing Lorna and Mhairi for reports of eerie goings on in their bedroom, I also had a frightening experience when I rushed upstairs one dark night to get something from their room when they were away from home. On opening the door, I was utterly shocked to feel a presence right in front of me. There was nothing there when I switched on the light. Quite how many have thought they have seen the Monster from the lodge's high vantage point is difficult to tell, but for less than half a million, you can get your own piece of Loch Ness real estate. The Counting House in Edinburgh hosted a series of speakers this weekend for the Scholarly Research of the Anomalous Conference. Since I live in Edinburgh, I made my way along to take part in proceedings. The event was organised by Gordon Rutter and Charles Paxton, who had previously done the successful "Nessie at 80" event at the same venue in 2013. Gordon organises the regular, monthly meetings of the Edinburgh Fortean Society which I often attend. First up was Darren Naish, well known author at the popular Tetrapod Zoology blog. He spoke on "The Evolution of Sea Monsters in Terms of What people Report". Darren spoke of the four phases of Sea Serpent cryptozoology, starting with the classic exploratory stage in Victorian time when biologists such as Huxley and Owen would debate living plesiosaurs. From there is was onto Oudemans and his pinnepedial Megophias and then onto Bernard Heuvalmans' more complex classification system of up to ten variants. Finally, the revised taxonomies of Coleman, Huyghe and Champagne. But Naish sees us in a post-cryptid cryptozoological period and perhaps in a last phase as these reports are re-analysed. I could see the parallels with the Loch Ness Monster and would disagree with the post-cryptid scenario. But it was an interesting talk nonetheless. At the end, I asked Darren if the presumed absence of serpentine megafauna in the seas suggested there was evolutionary pressure against such a morphology. He thought this was the case for mammals and the way endothermic energy is dissipated in such a shape, but not so much for exothermic. Which suggests a gigantic and slender reptile or fish is not impossible, yet nature (from a sceptical point of view) has not seen fit to produce such a beast. Then again, perhaps not. Charles came up next with a familiar theme, the statistical analysis of cryptid sightings. This has been a long running pursuit of Charles' in the sea serpent context and now for the Loch Ness Monster. The problem for analysts such as him is to measure the precision and accuracy of such anecdotal evidence. One can make some estimate of this by comparing the same single eyewitness accounts over different time periods or comparing multiple eyewitness accounts of the same event. The other is to attempt to set up a controlled environment with known parameters and measure how eyewitnesses make their own estimates of distance, length, height, etc. It turns out Charles had some Edinburgh Forteans go past some witnesses in a Bigfoot-like suit in order to measure their responses! In terms of the Loch Ness Monster, I later suggested to Charles that he should try and track down the transcripts of the 2005 Channel 5 documentary "Loch Ness Monster: The Ultimate Experiment" where an animatronic plesiosaur was put into Loch Ness for unwitting boat passengers to see. It would be interesting to see if it contained any witness estimates of the object's attributes. After lunch, it was Roger Musson of the British Geological Survey in Edinburgh. He spoke on the 1974 Berwyn Mountain UFO case which is dubbed by some as the "British Roswell" as it allegedly involved a crashed flying saucer. Even though this was the only non-cryptid talk, I had an interest in it as a documentary on this case had recently appeared on British TV. As it turns out, Roger's explanation that the crash noise was actually a magnitude 3.5 earthquake made sense. The interpretation that the lights seen in the area were poachers' car lights and/or meteors was more open to debate. I asked him at the end whether such an earthquake instead could have produced light energy as well as sound energy. I offered that theory with Paul Devereux's Earth Lights theory in mind. Roger did not think so in this case, but was open to it happening in other cases (such as one in Lincoln in 2008). Dr. Bildhauer from St. Andrews University next spoke on "Monsters in Medieval Manuscripts". That world was a world of all manner of strange beasts including unicorns, dragons, basilisks, mermaids, sea serpents, crane headed people and single footed humans. We also had an insight into medieval medicine as the four humours of black bile, yellow bile, blood and phlegm were explained and their relation to the Evil Eye of the basilisks and witches. Things got even stranger as this was linked to menstrual cycles. Changed days. I have enjoyed and been informed by Mike's fortean writings over the years, so it was a pleasure to at last meet him and hear his talk on "Our Artist Pictures What the Witness Saw". Mike's talk focused on the various artistic renderings of Fortean phenomena that have been less than accurate in the representation of what the witness saw. Such pictures are almost too numerous to mention and range from the sea serpent drawings of the HMS Daedalus in 1848 to Mike's dealings with artistic depictions for the Fortean Times. It is an issue I have seen myself in the Loch Ness literature, though original witness testimony and sketches can obviate some of the more dramatic touches of periodical artists. I pointed out to Mike later that embellishment is a two way street and pointed out the case of Maurice Burton and his sceptical 1961 book, "The Elusive Monster". In that book, Burton, shall we say, reinterpreted one or two photographs as drawings to fit his theories. Moreover, his drawing of a deer which, by coincidence, looks amazingly like the Greta Finlay creature is "interesting". The day ended with an informative and entertaining Q&A session involving all the speakers. Just to show these people were not all crusty sceptics, they were asked which Fortean phenomena they gave credence to. Darren Naish said out of place cats, Mike Dash had a penchant for poltergeists, Charles Paxton was still open on large, undiscovered creatures in the oceans and I am not sure what Bettina and Roger said. My only question to the panel was for Roger the seismologist. I recalled reading a book on an earthquake in Inverness at the start of the 20th century and how the author described seeing the waters of Loch Ness boiling like a cauldron. Roger said this was in 1901 and was one of the largest recorded earthquakes in Britain. The effect on Loch Ness was perfectly explicable as a giant standing wave shaking the loch as opposed to my expectation of a tidal surge. That must have been a sight to behold. All in all, it was a good day, and I look forward to the next conference.